Lower back pain in pregnancy is very common. It is often accepted as a normal part of pregnancy but this is no reason for women to suffer with the condition. Although several anti-inflammatory drugs may help with pain relief and can be safely used during pregnancy, most pregnant women would prefer to stay away from medication. However, there are many other simple ways that pregnant women can relieve lower back pain without opting for the chemical route. It is important to first understand why lower back pain is so common during pregnancy. Some of the causes can in fact be avoided with just simple lifestyle changes. There are several reasons for lower back pain during pregnancy. It is often a result of the normal changes that occur in the body. But sometimes it may associated with injury that may be caused during the course of pregnancy. There are instances where previous back injuries, even before falling pregnant, only becomes apparent during pregnancy. Increasing body weight especially during the later stages of pregnancy. Larger abdominal girth due to the expanding uterus. Abnormal and excessive curving of the lower back. Not resting sufficiently especially in the second half of pregnancy. Separation of the lower back and pelvic muscles to cater for the enlarged uterus. Pregnancy-related hormones that cause slackening of the ligaments which reduces lower back support. Bending over and lifting objects without using the knees. Wearing the inappropriate footwear while standing or walking for long periods. Sometimes a poor quality mattress, abnormally large breasts and excessive pregnancy weight can worsen the back pain. 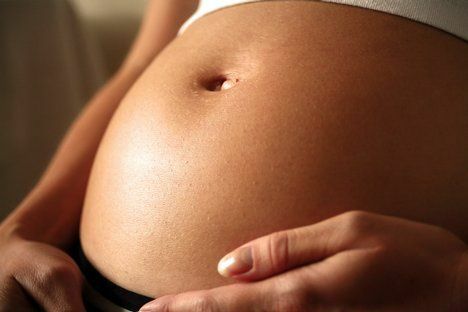 Do not suffer in silence with lower back pain during pregnancy. Speak to a doctor and opt for physical therapy if you do not want to go the drug route. Lower back pain in some instances can be due to serious conditions and not just a matter of muscle and joint strain. Your doctor will decide if further investigation are necessary to identify the exact cause of lower back pain. Pregnancy can be a challenging time for your body. Although you do not need to stop living a normal life, it is important to rest as much as possible. Resting does not mean having to sleep all day. Just sitting for a while and putting your legs up can ease the strain on the lower back. Remember that the entire weight of the head, trunk and arms are transferred through the lower back to the hips and down to the legs. With an increasing upper body weight, wider abdominal girth and abnormal posture, the lower back weight has to bear additional strain while walking or standing. Resting as often as possible is therefore recommended. Although resting as much as possible is advisable, sleeping flat on your back tends to worsen lower back pain. The additional weight of the pregnant uterus applies force downwards towards the lower back due to the pull of gravity. It can also alter the natural curvature of the spine and further strain the back. Therefore it is important to sleep on your side rather than on your back. A pillow between the legs may make it easier to sleep on your side especially with one or both knees slightly bent. It may not be a major problem to lie on your back for short periods but avoid sleeping on your back throughout the night. If you are going to stand or walk for long periods, make sure that you have the right footwear. High heels and platform shoes should be avoided. Pregnancy changes your normal gait which strains the joints, pelvis and lower back. Wearing the wrong type of shoes can exacerbate the situation and therefore contribute to lower back pain. Pregnancy is not a time to worry about fashion especially if you are experiencing discomfort or pain when walking or standing. Rather opt for the most comfortable footwear that can minimize the lower back strain. It should be low-heeled shoes that minimizes excessive arching of the feet. Instead the feet should be as flat as possible. Going barefoot when possible, like while at home, is often better than wearing shoes. Both hot and cold applications can be helpful for easing lower back pain without posing a risk to the unborn baby. Heat improves the circulation and eases muscle stiffness. Cold can reduce inflammation and numb the area. If you have sudden and intense lower back pain then try to ice the area first. Avoid placing ice directly on the skin. Instead use an ice pack. Once the initial inflammation subsides, heat therapy may then be helpful. A heat pad or hot water bottle placed on the lower back can be used to treat lower back pain and even prevent it after activities that may have strained the area. Strenuous physical activity during pregnancy should be avoided. It can worsen lower back pain and even seriously injure the spinal column. However, gentle stretching and moderate exercise can be helpful for a range of muscle and joint problems in pregnancy. Always speak to a doctor before starting any exercise program. Even if you have been gyming for years, your current exercise regimen may not be suitable for pregnancy. Gentle physical activities like yoga may offer the benefit of stretching and exercise. Ideally find a yoga class in your area that is specifically for pregnant women. Maintaining the right posture is one of the most effective ways of minimizing lower back pain in pregnancy. 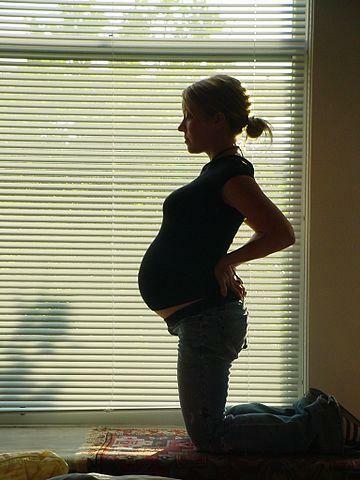 Many women tend to curve the lower back excessively and slouch in the later stages of pregnancy. Even the increasing breast size can cause a change in posture. Speak to a physical therapist about the optimal posture to maintain during pregnancy. While your body is undergoing changes that will not allow for the ideal posture, simple changes in the way you walk, stand and sit can greatly reduce lower back strain and the associated pain. Using proper supportive clothing around the hip and lower back area can also assist with the proper posture.